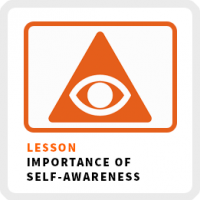 Lots and lots of people are talking more and more about self-awareness. Articles about it are popping up in very established business publications like Harvard Business Review and Inc. Magazine. If you are familiar with Gary Vaynerchuk, he believes it’s more important than hustle for getting your business started! Self-awareness is about being honest with yourself, but not judging yourself. It’s your ability to observe your life without judgment from a third-party or bystander’s perspective. It’s like watching yourself as if you hired a private investigator to watch your every move. To be clear, self-awareness is not self-judgement. It’s not making a criticism, it’s merely observing yourself without knowing the cause of the behavior. It’s about articulating all the possible consequences of your behavior and then deciding which outcome aligns with your goals and values. For example, I drink significantly less alcohol than I once used to. Without judging myself, I recognized that the consequences of drinking way more than I needed was completely out of alignment with my goal of creating quality work. It made me tired, gave me a shorter temper and made my thinking fogger. I’ll give you 4 reasons why your life will be infinitely better if you become more self-aware. #1 Self-awareness is how you learn about yourself, your needs and your potential. No one else has ever been you before. How else are you going to learn about yourself? You are the expert of you. Self-awareness enables you to reflect on how you feel about what you experience. #2 Self-awareness helps you minimize your reactions to help you make more intentional decisions. When you make decisions with intention, you make them in alignment with your values and goals. Without being self-aware your brain goes on autopilot. You react to circumstances without understanding even why you reacted the way you did. #3 Self-awareness gives a voice to your inner voice. Our conscious thought dominates our thinking. We believe we need to rationalize all our decisions to justify them. We end up taking actions to please others without considering our own feelings. Turns out your feelings are a much better indicator of what really motivates you. Self-awareness gives your feelings a greater role in your decision-making process. #4 It helps you see patterns in your thoughts and behaviors. Remember, your life is the sum of your habits. Self-awareness enables you to monitor your habits to see if they are in alignment with your goals. If self-awareness is the most important life skill, why aren’t we all taught how to practice it? Great question! I believe our culture has overemphasized the importance of our conscious brain and underestimated the power of our subconscious. My personal experience has shown me that my subconscious mind often knows what I want before my conscious mind does. Self-awareness also seems too “touchy-feely” because it can’t be easily measured and because it’s so subjective. Never forgot that no one else can ever tell you how to feel because it’s not right or wrong, it’s just how you feel. Self-awareness empowers you to think for yourself. It’s not about justifying your actions to others. 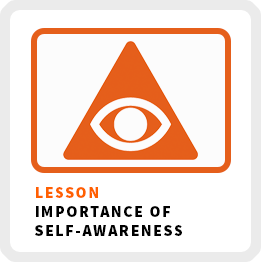 Self-awareness enables you to know yourself better and the better you know yourself, the better the decision you can make for your life and for your business.